Fabric bags are quick and easy to make in any size and for any occasion. They are beautiful and reusable. Also a great way to use large novelty prints. 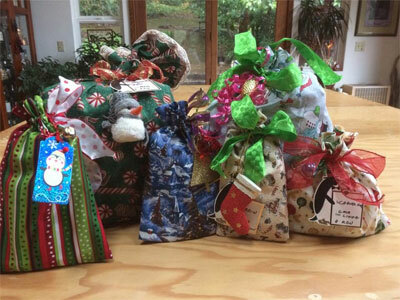 Join me for a demonstration on bag making and stock up before your next gift giving event and see how easy it is to get that last minute gift wrapped. This entry was posted on Tuesday, December 25th, 2018 at 1:32 pm	and is filed under Patterns, TSW Handouts, Uncategorized. You can follow any responses to this entry through the RSS 2.0 feed. You can leave a response, or trackback from your own site.